BEST SEEN IN XLARGE size. This car belonged to the Prince of Alwar (State) before India became independent and was probably used in hunting expeditions. The two search lights near the door could be rotated and the hood covering could be taken off. Also notice the two rifles kept in the special case! Dastaan farm situated about 30 km outside Ahmedabad, is a splendid collection of vintage cars at the Auto World Vintage Car museum (Dastaan farm). 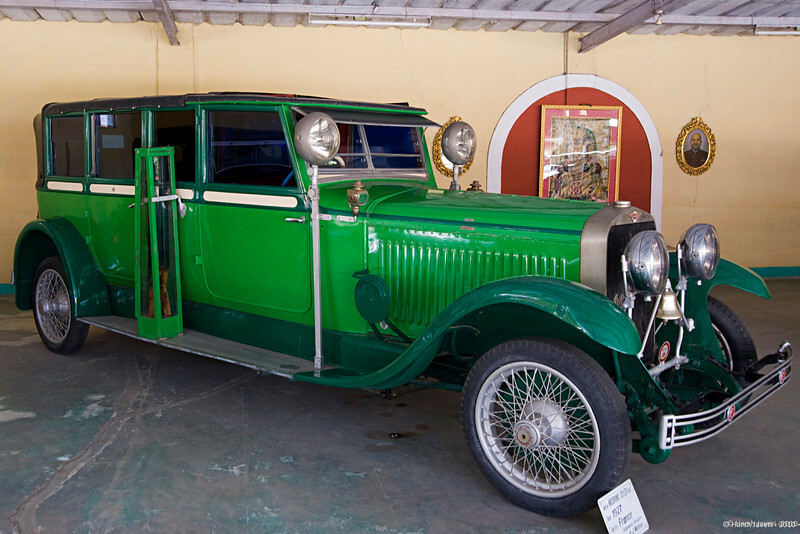 Privately owned by Mr Pranlal Bhogilal, it has over 125 cars such as Rolls Royce, Bentley, Model T Ford, Jaguar, Chrysler, Mercedes, Fiat, Maybach, Packard, Cadillac, Buick and more... Founder-president of the Vintage and Classic Car Club of India, Mr Bhogilal may have the largest collection of vintage cars in the world. More than numbers, the important point is that all the cars have been restored to perfection and are in working order. The place also has a ethnic restaurant serving delicious Gujarati food making this an ideal place to spend a day with the family. Amazing vehicle -- looks like an old Dusenberg. Wow, check out that color! Lovely capture! very interesting - large searchlights!